Thread: Removing weight from a A2 Hbar barrel caalculating weight removed? I have a frankenbuild project. Its being done with parts on hand. My rifle that was legal for the last few years is no longer legal this year in the match I shoot. I bought what I was led to believe was a A2 government profile barrel. upon inspection (removed the A2 hand guards for a free float install) it was clear my "a2" is really a "Hbar style" I already cut off the muzzle brake(muzzle devices need to be pinned and welded here) and about 1" of barrel to make the install of the hand guards easier. Plus i have no intention of installing any muzzle devices. Any how I still need to shed about 1.0 lbs. The barrel has a 10" area between the barrel "lug" and the gas block measuring .950" the original A2 is aprox .675 tapered from the chamber to the gas block thats .750"
1. the best method of removing metal A. Fluting or even just flat side cuts? B. remove metal around the complete circumference? 2. How much weight would be shed if I removed metal from the 10" thats .950" down to .750" ? Since this is not a "high accuracy or value rifle" Looks dont matter. End result it needs to hold 3 min or better....it does already. thanks, very new to "machine" work. Im no stranger to tools or taking time to learn. as for the salads..... I had to shed pounds myself as my shooting jacket is defective and it keeps shrinking! This is why they gave us word problems in math class. The barrel is probably 4140, or an alloy close enough that it won’t matter, Look up the density of 4140, and figure out how much volume you need to remove to lose 1 pound. 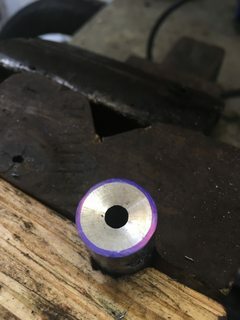 Figure out how much of the barrel diameter needs to be removed to take out the proper volume of steel. 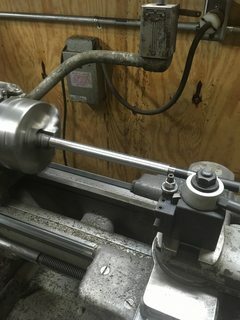 Put the barrel on a lathe, and remove it. Or put it in a mill and flute it. Lots of math. The bonus is that when you are done, and someone ask if you ever use geometry and algebra in real life, you can say yes. A cylinder .750" ID x .950" OD x 10" long made from 4130 would weigh approximately .757 pounds. Combine that with some barrel fluting forward of the gas block ought to get you that 1 pound total weight loss. Vs .750 is 4.4 cuin3 or about 12oz plus what ever I can shave off the 4" in front of the gas block. Was thinking of just milling 4 flats and retain some of the barrel radius for looks. Plus I can still cut a few inches off the muzzle end for about 2 oz per inch. Pac-Nor has a barrel weight calculator on their site. Also cut off the welded on muzzle brake I did not like plus another few inches off barrel now its 17.00033400556677" long.